From the ashes of a true hero--the technologically-advanced, Turbo Rider--a modern defender shall rise in a post-apocalyptic 1997, when Kid, a die-hard comic aficionado, stumbles upon his beloved idol's high-tech justice-enforcing gear. Maxim, fraîchement diplômée de l'Université Laval, qui en principe a tout pour être heureuse, largue chum et maison de banlieue pour tenter sa chance à Montréal à ses risques et périls. 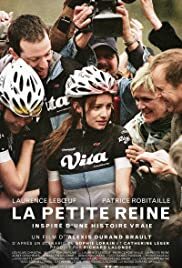 I only caught the last half of this film early this a.m. on a Quebec TV station (ARTV), but it interested immediately: the characters were well and realistically-played, the subject (doping, competitive sports) timely. The bicycle race in Belgium was effective, capturing the intensity of such events. That the central character comes up from behind to win gives a minor thrill, which is snuffed out when she is revealed before her celebrant teammates and others as having triumphed unfairly. The character may not be sympathetic, but she is realistic. As for her going to bed with her married coach: he eventually mentions divorcing his wife, and the film is from Quebec, where they don't judge these things quite so harshly.